The ground level of Barrier Reef anchors its defining feature—a 30-foot cylinder of glass swirling with colorful fish, barracuda, and sharks against a background of vivid corals. 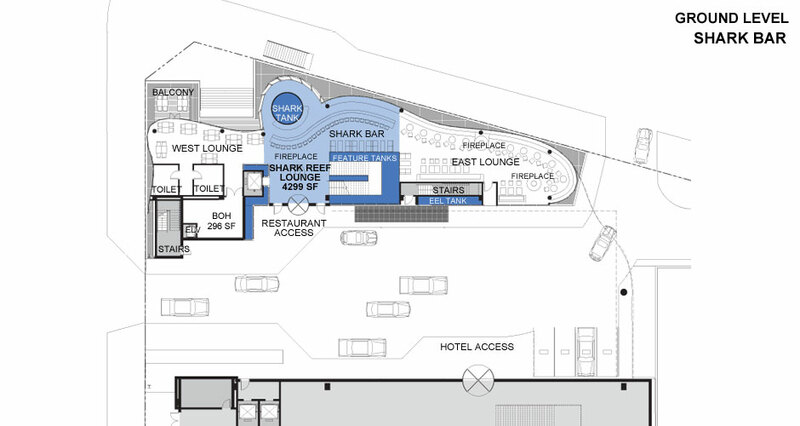 This is the compelling back bar facing 24 guests seated at the Shark Bar, its shimmering 50-foot sweep of blue, bottom-lit glass—a metaphor for brilliant waves breaking on a coral reef. 12' dia. x 10' tall; 25,400 gal.